Provided the photon does hit the electron, ph 1-2 will seldom hit the electron head-on. All possible futures of ph 1-2 are given in fig.6. fig.5: All possible pasts of ph 2-3 fig.6: All possible futures of ph 1-2. All shown electrons move in different directions. No two of the 2-photon-reactions (1 photon in and 1 photon out) share an associated electron of identical impulse - needed to superpose reactions with identical out-photons (but with a different in-photon). No aligned in- and out-photon have same energy - needed if we want to assemble them to one reaction and then superpose with a passing-by not-reacting photon. Except for ph 1-2 and ph 2-3 which have been chosen as our starting condition to suit perfectly to each other “as if the reaction hadn’t taken place”. 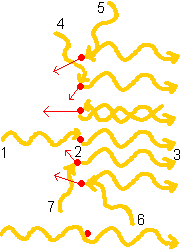 The incoming photons in fig.5 like ph 4-2 are more energetic than the aligning outgoing photons in fig.6 - ph 2-11 in this case. (Let’s take ph 4-2 and ph 2-11 to be aligned, although the pictures are not really decisive about that.) The incoming photons have to provide ph 2-3’s energy plus the electron’s kinetic energy. All outgoing photons have to share ph 1-2’s energy with the electron. Except for the reaction ph 1-2-3 again. It is time to loose our designated future. As well as our past we already have forgotten. We only know our local environment. All we know ends at its borders, all possible universes surround it in superposition: the sea of possibilities. To it all possible pasts can lead. From it all possible futures can sprout. Take event 2 as local environment. In fact, take the electron at event 2 - we can’t deny its existence there. Before event 2 the electron is standing still. After event 2 it can have every state of motion. Let’s start from a specific electron state after 2 (in stead of a specific incoming-photon state). 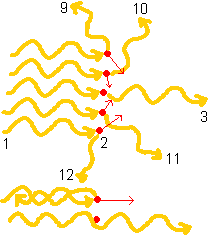 fig.7: The incoming photon may come from any of the upper-left directions. 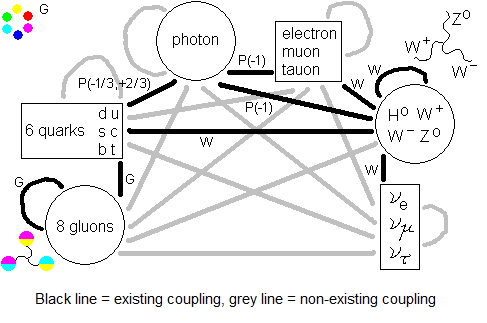 The outgoing photon suits to states of the electron and the incoming photon, according to the Compton scattering rules. Do all these possibilities superpose? That depends. There is no knowledge stored in our local environment neither about the photon’s past nor about its future. We only enter one specific future if we measure somehow the outgoing photon, by example by a measuring sphere around it made of photodetecting material. A past and a future must fit to each other according to the Compton rules. 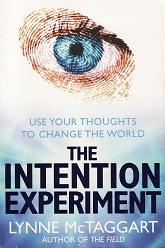 Within this limits the past is free to choose by choosing a future. Until then all possible futures of the photon superpose and with it all appropriate pasts. If there is open sky allowing this, the photons of two different futures may have originated at two different galaxies. Let’s call them galaxy A and galaxy B. If the photon turned out to come from galaxy A then galaxy B might even not exist, leaving only empty space there instead. Several influences might spoils this picture. In general there is gravitation. If something of the gravitational warp of one galaxy reaches onto our local environment its existence is written in the fabric our local environment is made of. Then we have knowledge about the galaxy. It cannot disappear when our photon turned to originate in another galaxy. Especially decisive too is light from galaxy A and B that reaches our local environment and by a sufficiently strong telescope reveals its existence on a photograph stored in some database long ago. We just can see the galaxies then when we check the databank. And when the light is there we assume the gravitational influence is there too, enough to spoil a superposition. Maybe we should not directly refer to galaxies. One single hydrogen atom in some state at the right place, instead of the distant galaxies, is enough. By allowing any state of velocity to the atom we can get from it a photon of every desired wavelength (Doppler-effect). Let’s call them atom A and atom B. We assume there is little chance any influence of such a single atom at that distance will enter our local environment. Except for our photon, of course. the past can be changed. Why this book? I red so many books about changing the timeline - although mainly science fictions, I am afraid. Maybe it was the direct way of stating it as an experimental observed fact without giving a physics explanation. Page 7 of the storyline NEWTON EINSTEIN KIEKENS GRAVITATION presents a new approach to the coupling. There a local environment equals the sum-”set of elements” of all particles in it. A local environment can be regarded too as each of the other ways (if there are) the sumset can be divided in existable particles. Assumed is the original sum-set as well as all other sum-sets do complement themselves at the moment of coupling with the necessary elements from the Higgs field. Each possible division has its own suitable new past and future. In this view, WHEN IT COMES TO THE COUPLING, the number of possible pasts-and-futures is limited to the number of ways the sum-set of elements of the local environment can be divided into existable particles. But there is more than couplings alone. By example, there are the indistinguishable vacuums, see page 6 of DIMENSIONS.